My Dominican mom always felt that having my hair blow dried was more beautiful because no one walked around with what she'd call "un pajon." My name is Leyla Aguilar and I live in the Washington, D.C. area. I am currently in college working towards my certification in Public Accounting while working for a mental health agency. I have been wearing my hair natural for the past two years. Growing up, it was not easy embracing my natural hair. My Dominican mom always felt that having my hair blow dried was more beautiful because no one walked around with what she'd call "un pajon." Whereas my dad, being Salvadoran, thought it was beautiful and different since everyone on his side of the family had straight hair. I was always confused. SunKissAlba on YouTube really inspired me to start embracing my natural hair. Seeing her before and after pictures and listening to her talk about her journey really inspired me to start my own. I am happy I did. What the natural hair scene is like in D.C. There are a lot of proud natural women where I live and that really warms my heart. Whenever I see another curly girl, I am always sure to compliment her so that she knows she is beautiful. Curly girls just click, ya know? can make eye contact with another curly girl and instantly y'all are low key curlfriends, haha! Many of my girlfriends now embrace their natural hair which is always a plus, too. 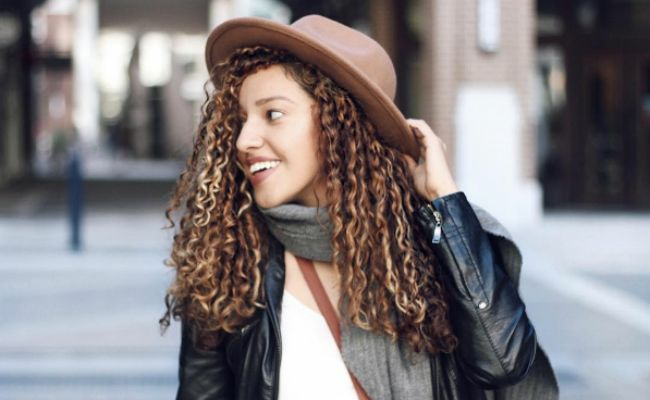 I think curly hair is so beautiful, especially all of the different types of curls--uniqueness! I learned to love myself and that putting myself first more often than usual isn't selfish, nor conceited of me. Overall, this embrace has made me more positive about my own beauty. I feel more confident now with my curly hair than when I decide to straighten it. Don't stress out all the time. It will eventually take its toll on you girl, so calm down! If you'd like to keep up with me, follow me Instagram, snapchat, and twitter @beyondhercurls. You can also visit my fashion and hair blog, Beyond Her Curls.